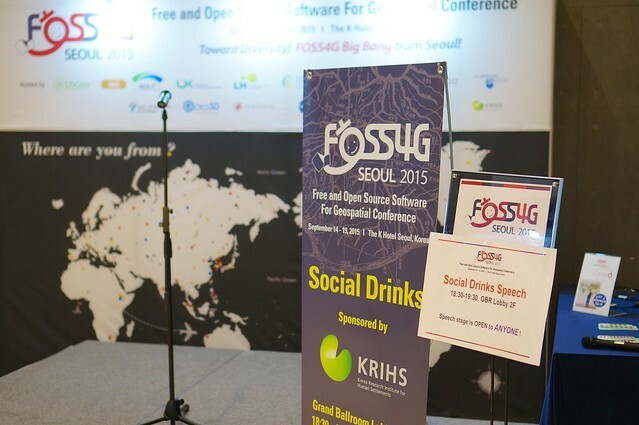 FOSS4G has just finished up in fabulous in Seoul Korea. Online I see the occasional calls for "what is going on?" and "are they recording video?" Yes, videos will be available on the conference website at a later date. As for what is going on let me gather up my blog posts on the topic. 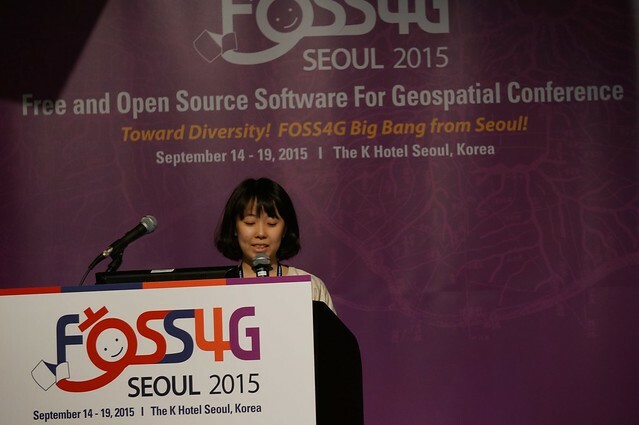 FOSS4G 2015 – Seoul - GeoCat blog post by Maria hits many of the key themes for the conference. 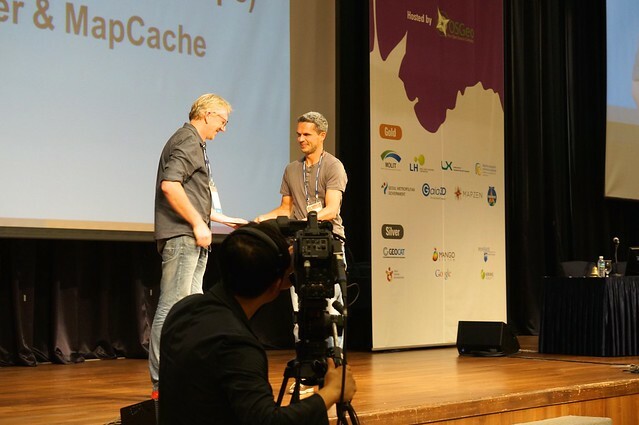 Thanks for the blog post Maria, and thanks to GeoCat for sponsoring developer recognition awards. foss4g group collects photos from everyone at the conference for even more "wish I was there" opportunities. The conference was a great success with 562 attendees. Thanks to everyone who made this event happen. Andrea and myself focused on outreach with the ISA Server team working with ISO 19107 and Complex Features. I really hope this relationship grows into more members for our community. Ian Turton and Andrea wrestled with drawing GeoTools DirectLayers (think scalebar) and labels as the same time. Eventually they blamed me, so I have some API work to do on the flight home. After an inspiring conversation with OpenLayers developers Andrea started looking into checking coverage as part of pull request evaluation (with the idea being that a pull request that reduces test coverage is not acceptable). Andrea and Tom worked on raster performance resulting in some amazing visuals of 8K images and the point of the exercise ... a pull request! To start out day 3 we must of course talk about ... coffee! 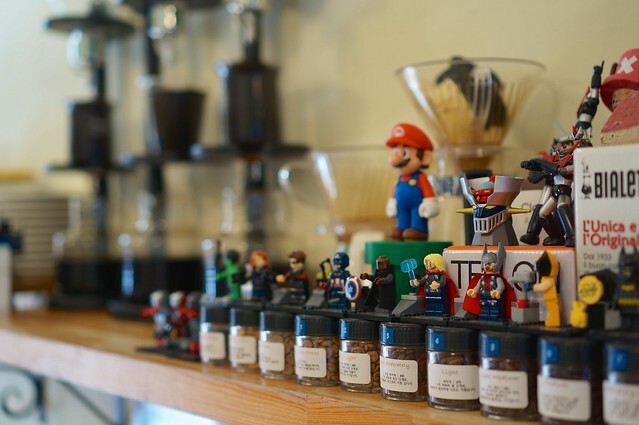 Coffee Zip across from the conference is a lovely hipster Korean experience with pourovers, cold press ... and small robots standing guard. Presentations were smooth on the last day of the conference, with both attendees and presenters knowing what to expect in terms of pacing. I really appreciated the additional questions today as I had a number of talks scheduled. 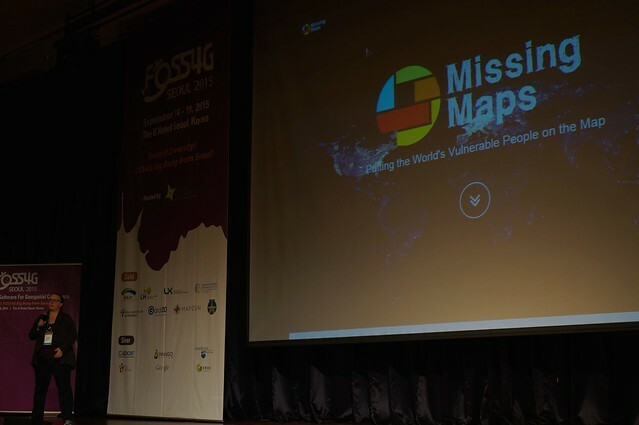 Citizen Science, VGI, Geo- CrowdSourcing, Big Geo Data: how they matter to the FOSS4G Community (Prof. Maria Antonia Brovelli, Vice Rector, Politecnico di Milano). This talk explored how Citizen Science (i.e. Science done by the general public) is key to sourcing large datasets and the advent of "volunteer geographic information". This talk quickly explored many of the technologies enabling this shift, I was very happy to see geopaparazzi highlighted in the list! This was a cheerful positive talk and a great way to start out after a night on the town. I was especially impressed with the QA process checking open street map data against an "authoritative source" via WPS. It looks like WPS may finally be reaching critical mass. It is hard to introduce QGIS to this crowd, I was impressed with one individual out of hunderds in the audience admitted to using ArcView Desktop. Tricky balancing act, exploring the financial side of keeping the mapFeeder task tracker product going while contributing back to open source projects it is built on. There were some good questions raised - I expect this is a topic/track (that like free vs open) should be explored at future conferences. Hard love from a kind man - with examples that are painful to watch as an open source developer. 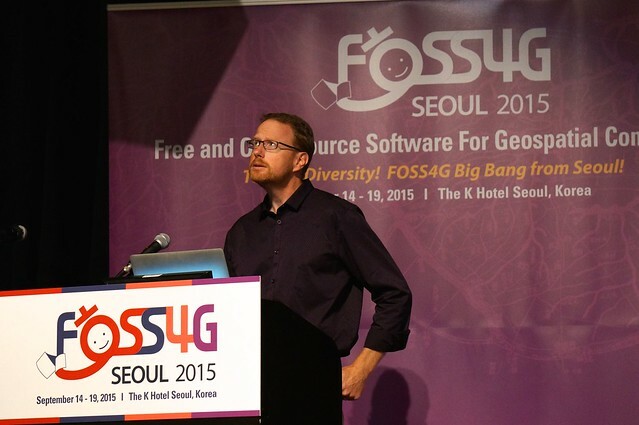 Ian draws on his long GeoTools experience (and StackExchange outreach) for this excellent talk. Task management for mobile business (vertical app using open source components). Great example of building a company around open source components. Fast, fast fast - with a nice open mic format. The conference tagline featured "towards diversity" and the lightening talks delivered in that promise. 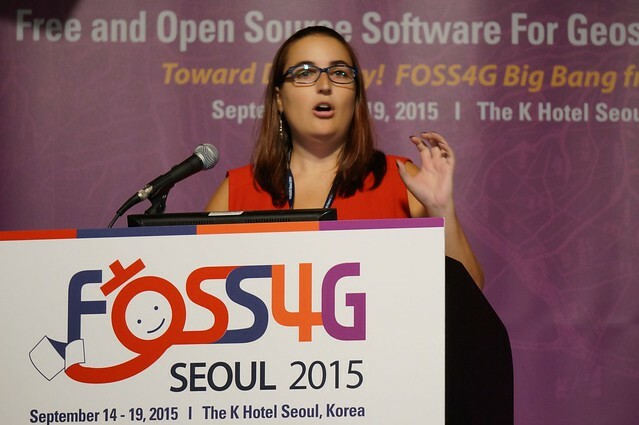 A special call out María's "braveheart" presentation discussing Free vs Open - it is important to keep "open source" advocacy alive and well at FOSS4G and not just focus on how helpful all the technology is. 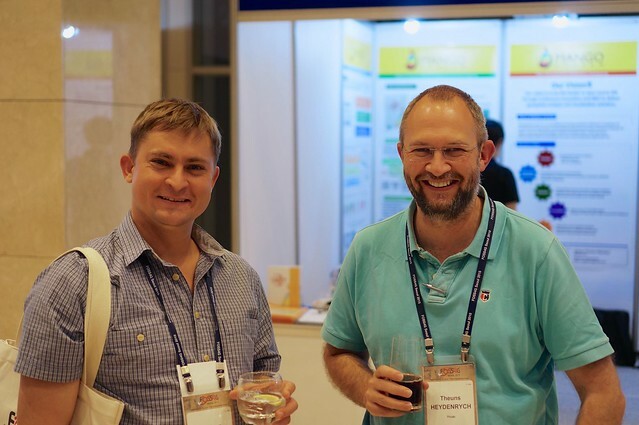 Good Aussie content with Hamish and Paul, I was pleased to see CRC-SI and 43/PL research getting out into the world. Although this was an academic talk, it provided a clearly spoken take on moving from data models to ontologies. I am starting to see more of these vertical apps built on open source spatial foundation. In this case the stack was cordova, jquery, open layers / leaflet, requirejs for a modern mobile stack. Storage was provided by a personal cloud api (dropbox and rest api). The project is available at https://github.com/edina/fieldtrip-open under a BSD license. Don't duplicate work, don't throw away tax payers' money. In this case highlighting collaboration between a small company and the Finnish National Geoportal. Collaborate by virtue of working at the same time resulting in joint development. While this seems sensible I feel it requires a lot of luck (for concurrent funding) and did not account for the communication overhead involved in an open project. Both of these factors require a lot financial backing to be successful. I have had several great technical opportunities for projects to collaborate sunk due to lack of funding for BOTH development teams to work together at the same time. This talk really raised more questions than it answered. 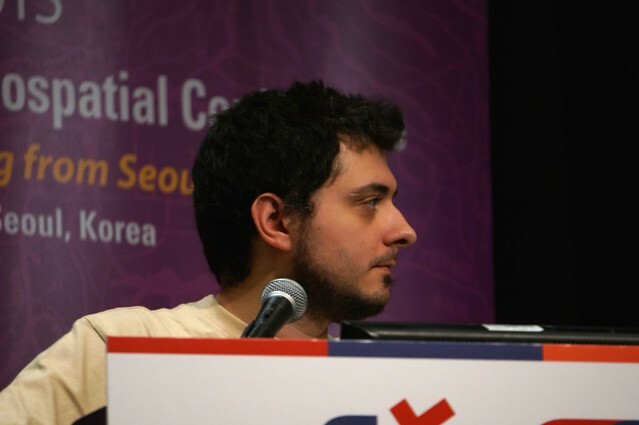 We all know Iván as an entertaining individual - it was a pleasant surprise to see him use his charm for a good comparison of these web mapping technologies. 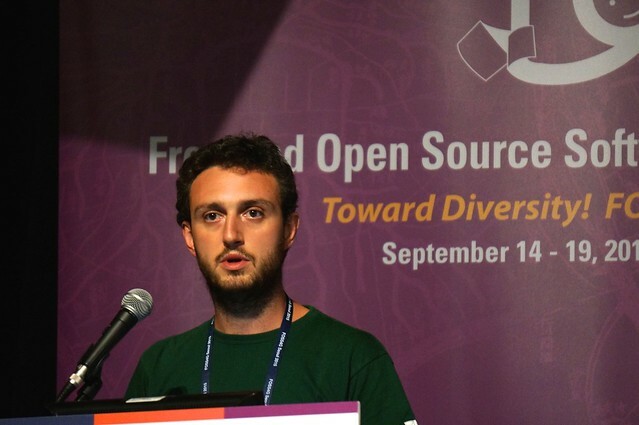 The OpenLayers team is certainly motivated, and aware the shortcomings highlighted, and Iván cheerful accepted the challenge when Leaflet could not meet his needs for indoor mapping. A quick status update from the WPS projects present (no benchmark this year as it is hard to figure out how to usefully benchmark a WMS service). In this case Jachym and Gérald carried the show. PyWPS is as cheerful simple and direct as always, and the ZOO Project has rounded up an impressive number of new features and an army of processes. The big news for GeoServer is that WPS is finally production ready (with support for security, limits on the amount of resources processes can consume and clustering support). I hope we get a chance to implement WPS 2.0 and catch up with the other implementations in the year ahead. 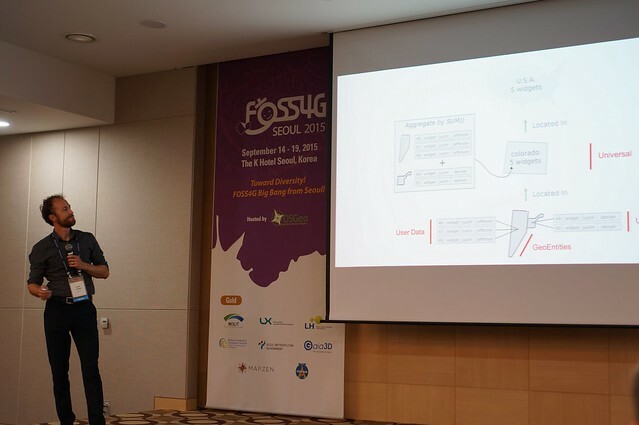 What really pleased me about this talk was the number audience members who had head of, and were using, WPS. Last presentation of the day - on what I hope is an important and useful topic. It is a bit of an honour to represent these organizations as they support our development teams. 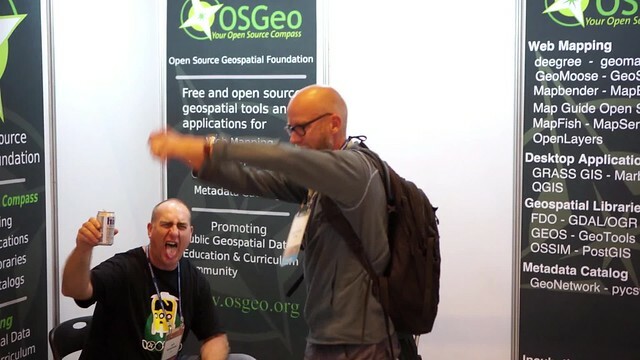 Big shout out to the OSGeo Live team - releasing software is the point of what we do and OSGeo Live helps make that happen. Jeff provided an enthusiastic, measured overview what our foundation is doing well and where we have opportunities in the year ahead. Jeff amused everyone with gradually coming around to the idea of 'shaking hands with a suit' as a positive activity - with the key insight being the growth of Geo4All being built on such relationships. 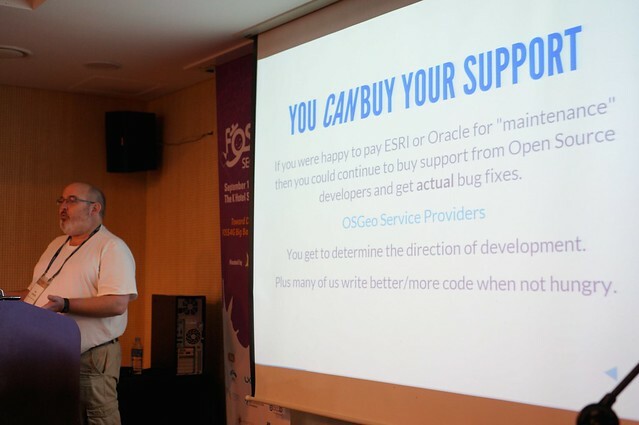 I also liked the increased recognition of organizations directly support OSGeo projects. A really classy move recognizing the developer community which makes this possible. Kudos to Gérald Fenoy and Thomas Bonfor. My notes were not quite able to keep up, so see the news announcement. I was happy to see the Hiroshima Archive win the prize of "The Best Cutting Edged Map." Maria Antonia Brovelli was recognized for outstanding contributions to our community with the Sol Katz award. Check out her slides above for some great pictures of the early days of our community. An entertaining video, an amiable host - next year will be great! 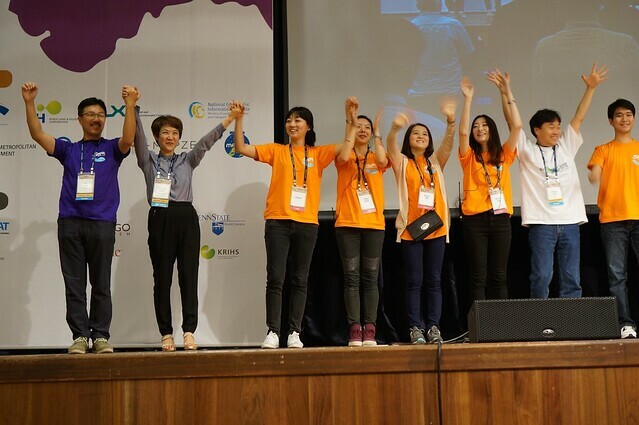 A big thanks to the organizing team. 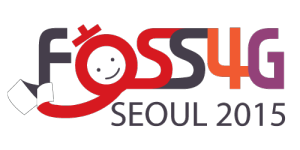 The Free and Open Source Software for Geospatial was held in Seoul, South Korea in 2015 (see round-up blog post). Thanks to my Boundless colleagues for such an enjoyable week and the Open Source Community for giving us so much to celebrate with this lovely conference. A bit of a slow morning as jet lag finally kicks in! This provided me with a great chance to hang out at the Boundless table and meet people (and prepare for tomorrow's talks). Inpromptu Lightening talksLightening talks are always a good time, presenters hit a range of topics (such as a preview of python geocoder talk or Kate talking about the missing maps project). 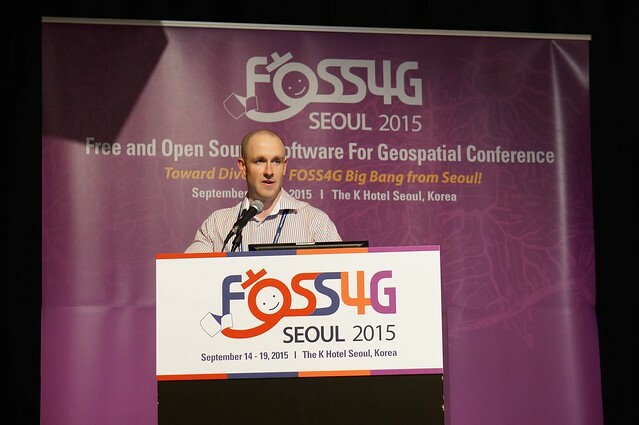 The big news for me was Andrew Ross announcing Raleigh as the location of foss4g-na 2016 conference. WebGL examples always offer amazing visuals, working with point clouds collecting by vehicle. 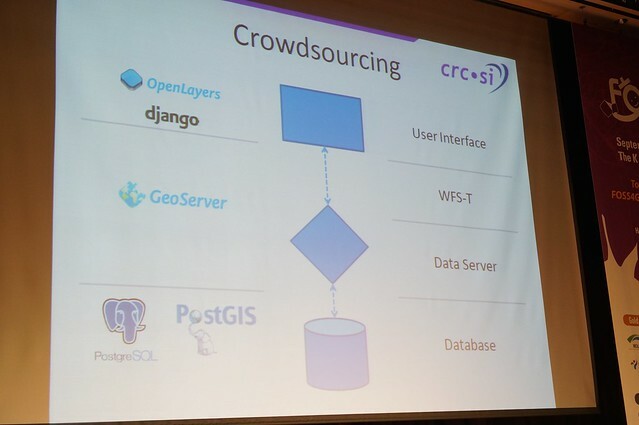 A good dose of what makes PostgreSQL (not PostGIS) so amazing. Crowd was really taken with the use of different scripting languages. Highlighting Curves and quality assurance (Perhaps I can finally stop using JUMP and JCS for data cleanup). Charming as always, amusingly using Kanas as a example (which is about as flat a 3D example can get!). Anyone asking questions win a free PDAL license! And a USB bottle opener. At one level this talk simply highlights a danger of working with a single vendor, especially for archival work such as this important project. It is a great that migration to CesiumJS went so smoothly well and speaks well for the Cesium team. It is a bit scary that migration from KML to CZML mean this archive now has "project lock-in". This was a heartbreaking dataset being used to show case technology. Incubation committee had to restructure (refresh the membership list). 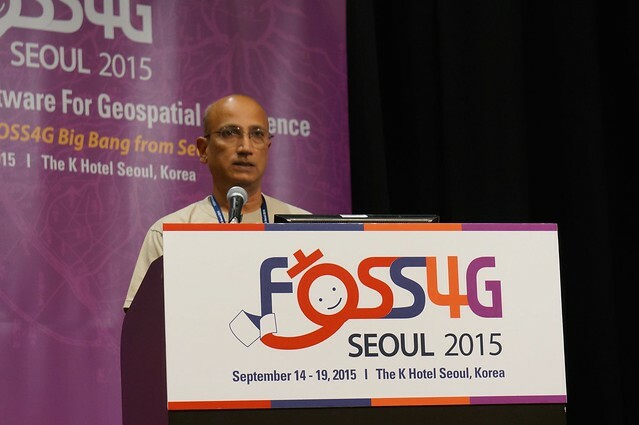 New projects added, gvSig really really close! GeoServer - once again thanks for help with Jira, some discussion on responsible disclosure and the advent of a private security email list. 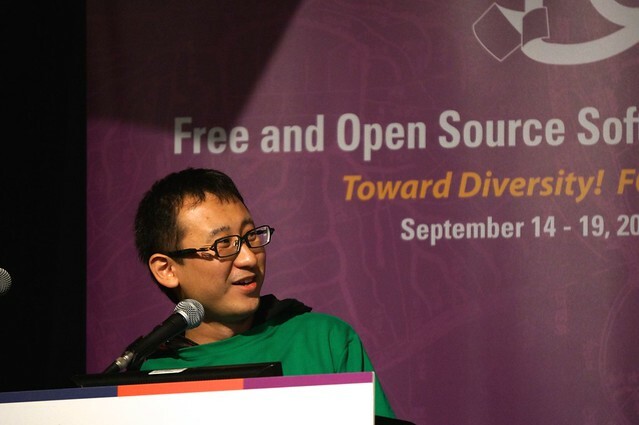 Paul once again dazzled the crowd with a thoughtful talk on the long-term trends of open source. Good news: we won! Bad news: with the move to the cloud less of us will be needed. 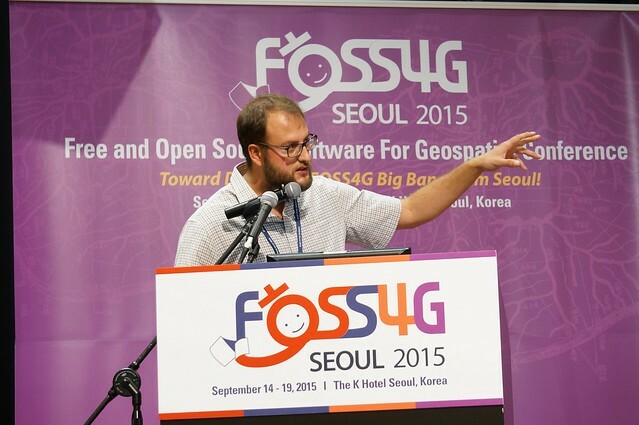 Discussion on the rise of QGIS focused on the Bazaar as the key success factor. With other desktop GIS system being driven by the Cathedral model. 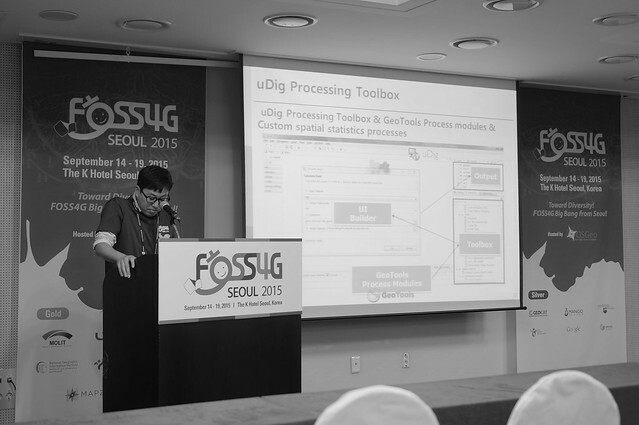 This did not quite match my experience (as far as I am aware gvSig and uDig were also open from the start). 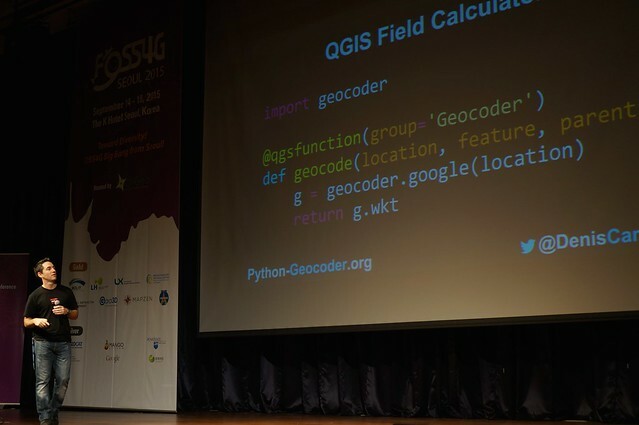 My take on the success of QGIS is due to a combination of critical mass and low barrier of entry to plugin development. A good time was had by all, and really showcased the diversity motto for the conference! An "arrow" game was a popular hit, I expect that the bucket needed to placed due north to improve the general accuracy of the group attending. Less popular was the open mic (and loud music) near the OSGeo booth. A friendly gathering of developers near and far, thanks to Andrew and Eddie for organizing. Great conversations about the upcoming LocationTech (and the possibility of adding Moscow into the mix). 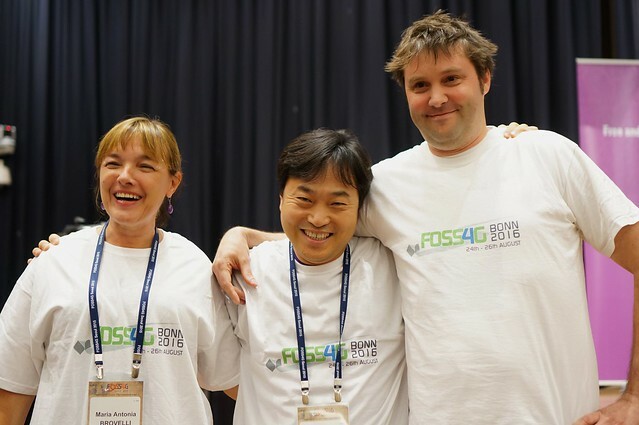 The big news is the announcement of foss4gna location for 2016. Retreated to another restaurant for dinner (could not imagine having German sausages in Korea?) and stumbled home - apparently missing a few other attendees in the subway (sorry!). 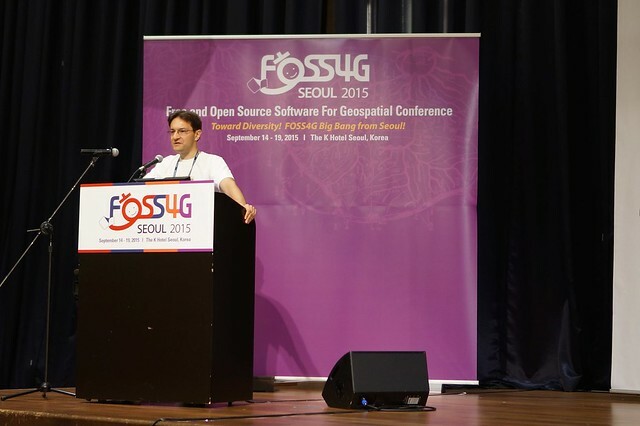 The Free and Open Source Software for Geospatial was held in Seoul, South Korea in 2015. Thanks to my Boundless colleagues for such an enjoyable week and the Open Source Community for giving us so much to celebrate with this lovely conference. 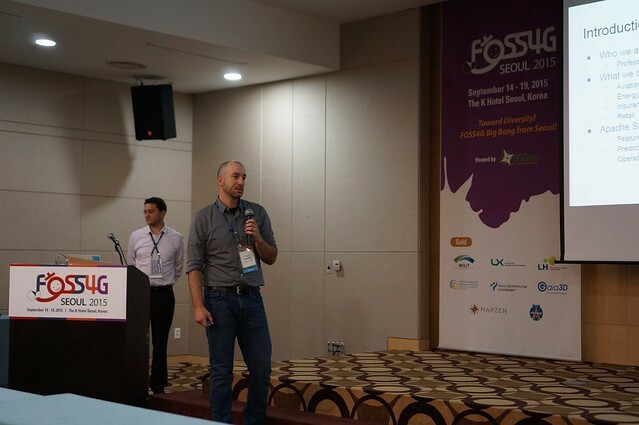 The first day of a FOSS4G conference really sets the tone for the event, in this case arriving at the extensive K-Hotel venue - and then being helpfully directed by orange shirts through registration and into the main "Ballroom B" for the keynote. 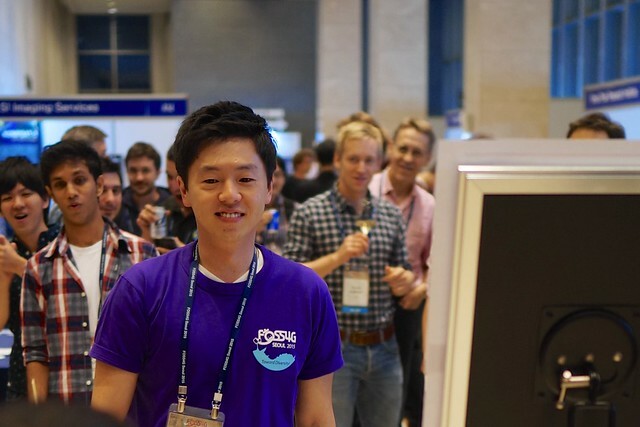 The exhibit area at the event is nice and bright and cheerful - and draws from both the FOSS4G conference (think t-shirts and smiles) and the Smart Geospatial Expo 2015 conference (think suits) which is running concurrently. The Boundless table is moving a lot of LocationTech "stickers" - providing a great opportunity for outreach. Although I notice whenever we leave the table any promotional stickers or mugs tend to vanish! 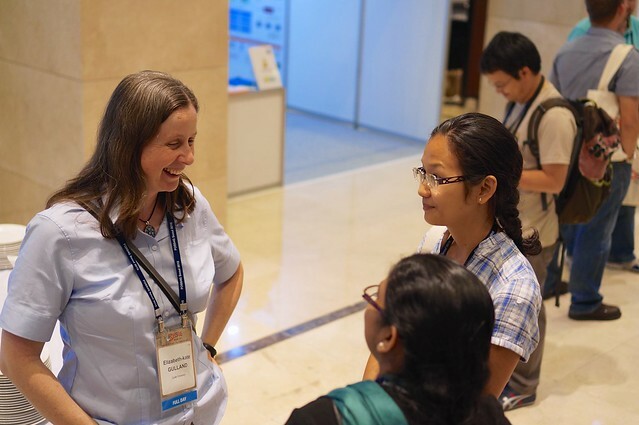 This is a great opportunity to meet everyone and catch up with open source colleagues. GeoServer 2.8-RC1 is out! Thanks to Kevin from the Victoria office. The gsconfig is now set up for collaboration and we are enjoying working with the GeoNode community on this one. The gsconfig project is a python wrapper on the GeoServer REST API. In a similar fashion the qgis-geoserver-plugin is in the process of being set up - please talk to Victor for more details. Gabriel's vector tiles community module for GeoServer is available, and makes for an impressive demo. OpenLayers is demonstrating vector tiles this week as well (kind of like we planned it that way). Composer is out of beta and included in OpenGeo Suite 4.7 - stop by for a demo and see what our development team has been hard at work on. GeoGig continues the long slow march through LocationTech incubation. We have our first round of incubation feedback and are rewriting our local storage from BerkeleyDB to sqlite. 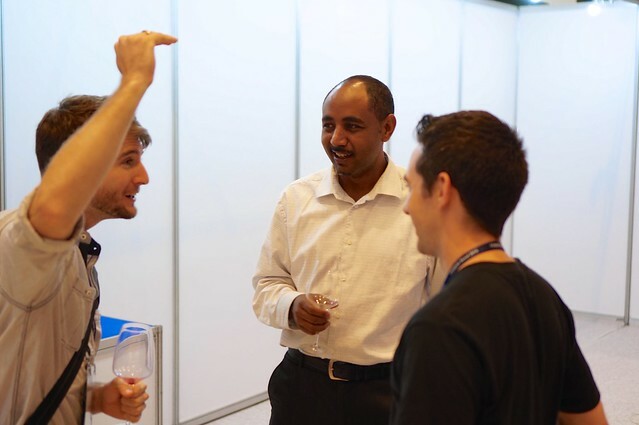 Presentations were very relaxed this year, with the occasional hour long coffee break! 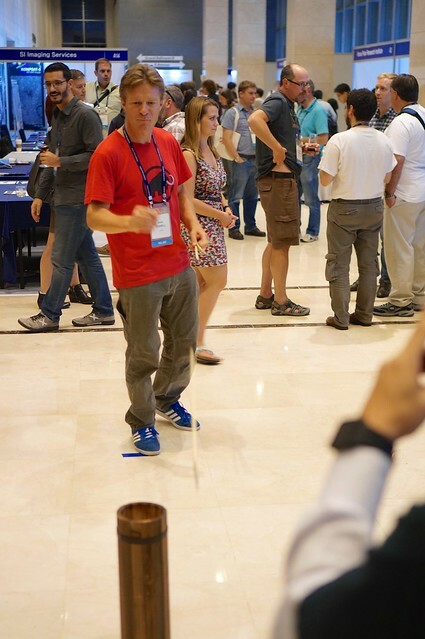 This calmed the whole conference down relative to previous FOSS4G conferences. The only "glitch" was that each session room did not keep to the same schedule - often running ahead. This left a few attendees disappointed (when they tried to bounce between rooms to pick up an important talk). 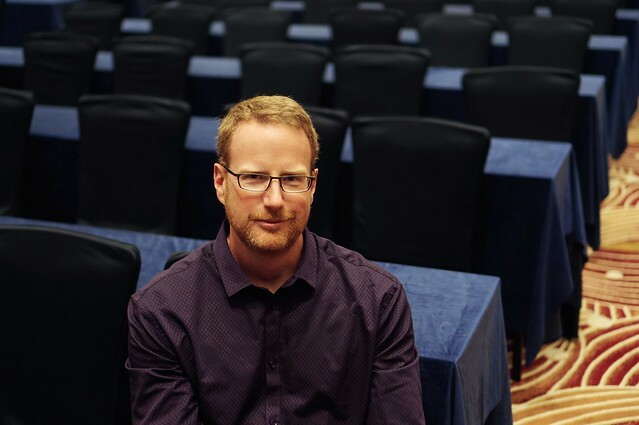 I am assured (via twitter) that videos will be made available on the conference website in case you were unable to attend, or missed a presentation you were interested in. 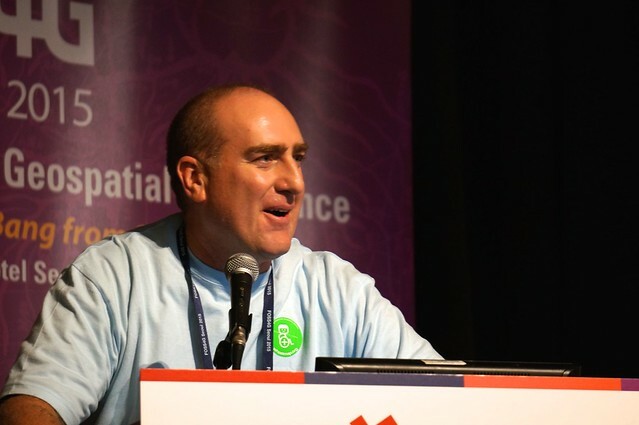 Geo4All is a real OSGeo success story setting up labs worldwide and providing instructors with course material so that open source software can be used in our education system. This gap has been one of the longest standing, and most heartbreaking, faced by our community. This keynote was an address from a local government which struck an odd tone (at least for me). 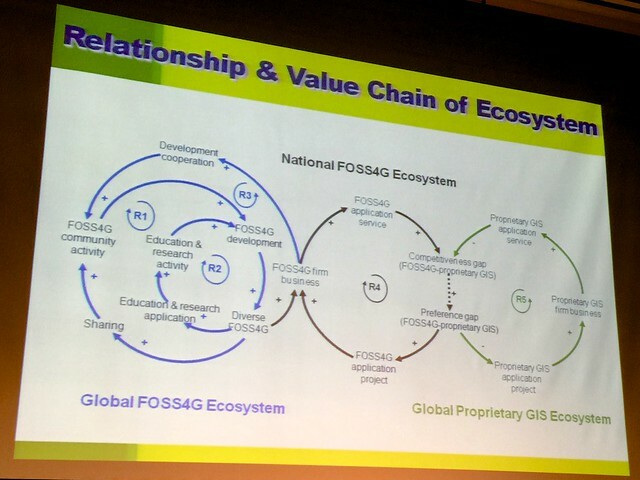 The national mapping agency had a long thought out presentation (with crop circle diagrams) showing how to fit open source into their procurement model. Sadly this still seemed to be taken from the perspective of "open source is not supported" (he should come by the Boundless booth). There are a number of approaches seeing success worldwide. Australia has had a strong open data push (with open source software sneaking in once the door is "open"). 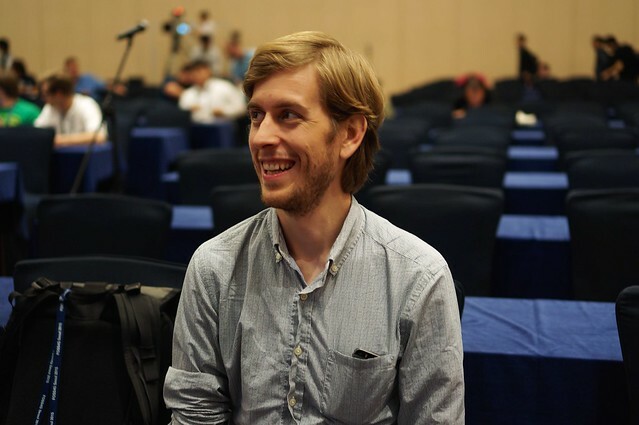 I would like to see governments join software foundations, double check their policies allow civil servants can take part in and start open source projects, and in general be part of the community rather than feel excluded. 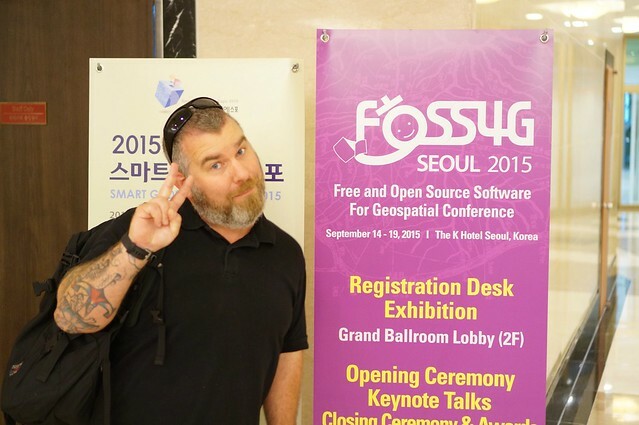 I expect this represents a failure in FOSS4G worldwide outreach. 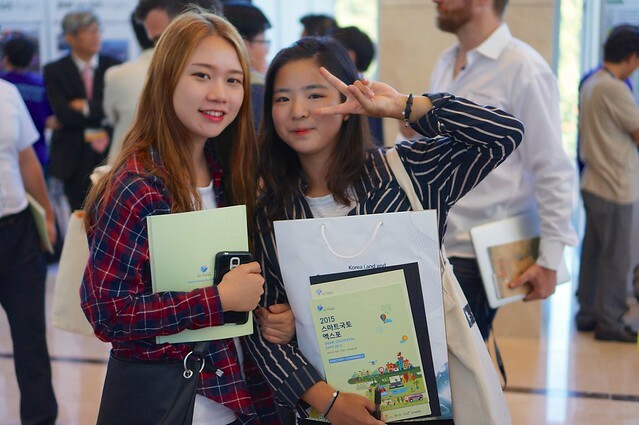 It is a good thing we are having the conference here and I hope the local community can these ideas further into the Korean government. Was totally impressed with the wide range of functionality on display, indeed I hardly know where to start. I must catchup online and congratulate Minpa Lee for his hard work. A talk so popular Kate had to do it twice - the session was running ahead of schedule, so people who arrived on time were disappointed to see they missed it. Kate did an excellent job, both times, of describing what this initiative is working towards. 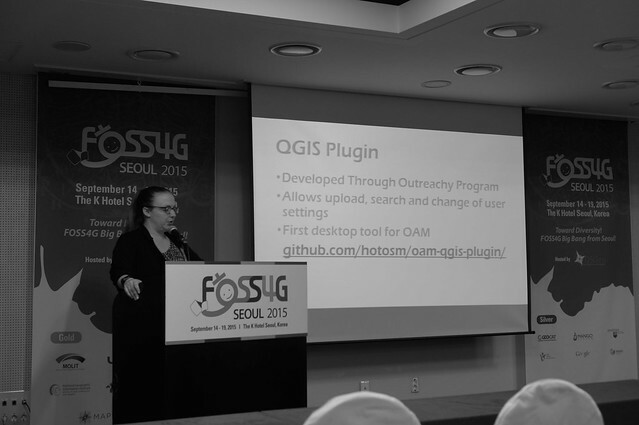 I liked the story of the QGIS plugin produced out of a HOTS diversity initiative. There was a number of good (i.e. hard) questions on policy from the floor. Inspiring story of leaflet development (perhaps the same talk as foss4g-na?) Animated GIFS (well, internet cats) are always a nice touch. Sadly this one was cut short on time. A quick crash corse in ontologies to set the stage for "geo" (a state is a member of this class of features). 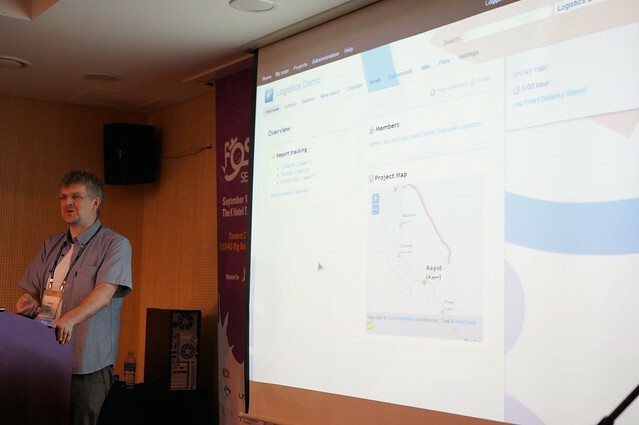 the demo was very impressive, ended up coming a cross as a smart version of CartoDB. Indoor GML application running in the the limitations of GeoTools (Complex feature read-only, no 3d operations- just data structure). They managed to bridge to a C library for the extra spatial functionality. Made a point of hunting this crew down for the GeoTools BOF as they are doing some impressive work. Tom once again breaks my head with sheer volume of data the weather company processes on a daily basis. A couple strong takeaways on the difference between Hadoop and Sparc scalability - and yeah, 18 billion requests a day with all those cell-phones checking the weather. Should make a map to take a picture of the sky and tell the user if it is raining. 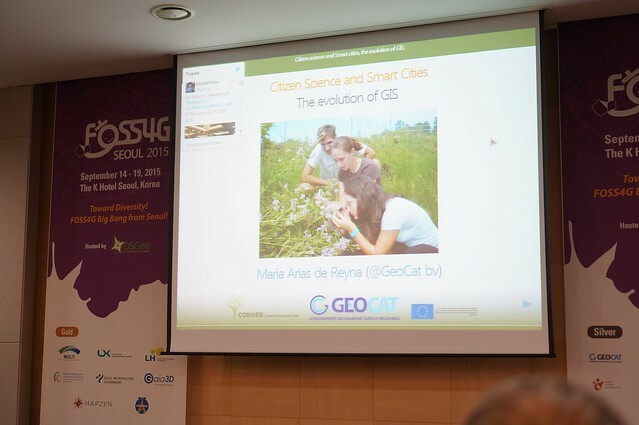 A real find this conference has been the enthusiasm of María and learning more about the GeoCat team in Spain. The demo of GeoNetwork really shows how far the application has come, and how much easier it is to use now. 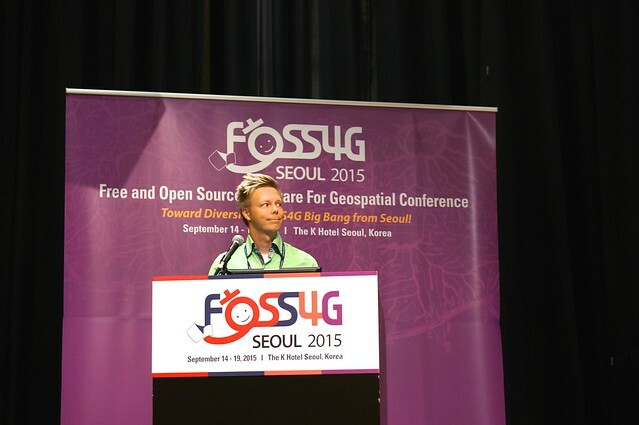 Paul is a force of nature at these conferences, and I learned a few things in this mad dash through PostGIS goodness. So much to say, I will just have to put up the slides. Andy did a great job of explaining what Torque does as a project, and demonstrating functionality. I wanted to ask a few more technical/community questions but that will have to wait for another time. 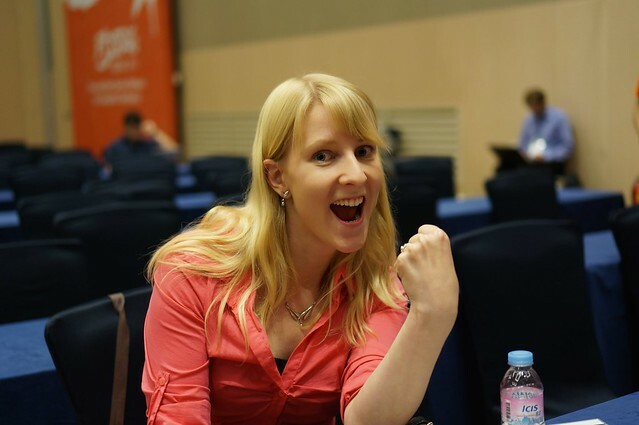 Hanna was here for her first FOSS4G and her first day speaking! 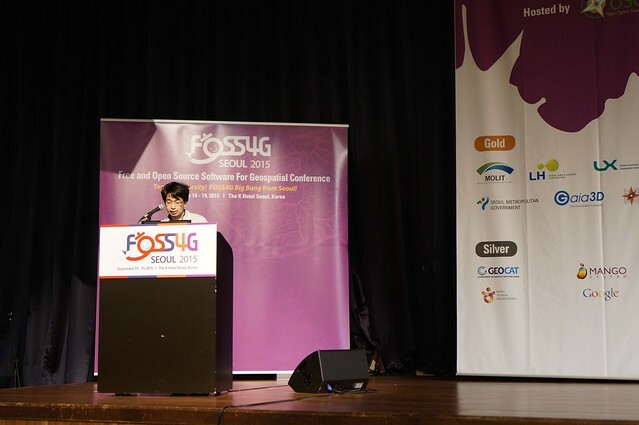 This was her second talk of the day, showing the crowd an impressive SLD editor written with Node.js. Some impressive performance numbers Tom Kunicki is getting out of JAI-Ext operators. We need to catch up with Tom and get the details. 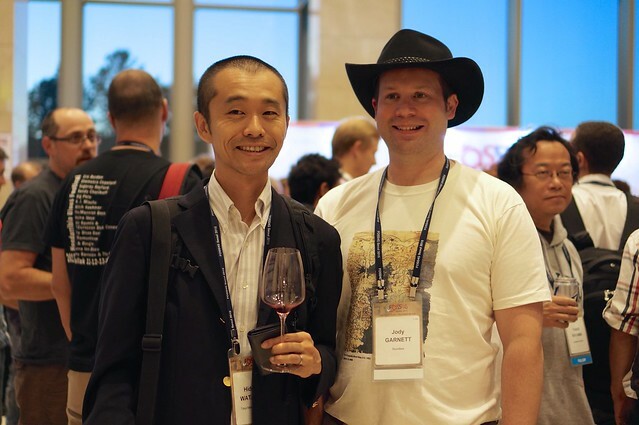 Discussion about how GeoTools community modules works, in the hopes of attacking the ISA Server team to share some of their RnD with the wider world. A bit of discussion around replacing JAI, and some of the angles we could use to get that work both scoped and funded. 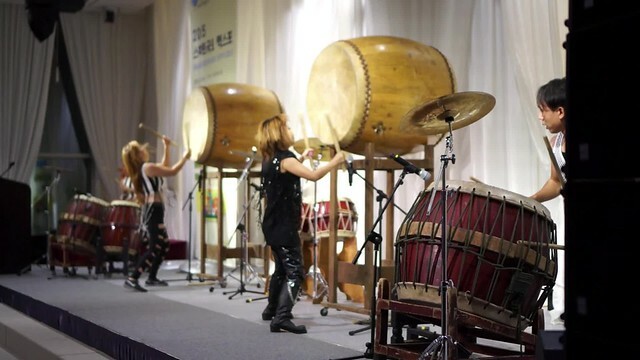 Excellent food, impressive drumming - but rather expensive at $110 USD if you bought your own ticket (by contrast the Korean BBQ after the workshops was $90 for a table of four). The other conference, Smart Geospatial Expo, had some kind of awards ceremony that Jeff was dragged into. Lucky Jeff :) The important part, as always, was the conversations! And the stand-up format allowed for everyone to wander around, search for napkins, and interact with more people than we would have if we'd been sitting down.